There has never been a more critical time for recruiters to focus on prioritising their job orders. Clients are tentative and decisions are slow to come, so we simply cannot waste our time on briefs that were never real in the first place. Working with clients who are not ready, willing or committed to hire is a disaster. Indeed, making sure you apply yourself to where you will get a return is the mantra we all should be living by every day. 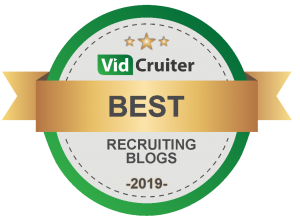 I wrote on this blog about tight talent selection, and also about the art of job order triage, and asking qualifying questions, and it might be wise for all of us to review the sentiments expressed there. It is a recruiting skill to actually dig into and expose each of these criteria, and maybe I will blog separately on that in future. But for today, from now on, run every job you take past this template. Be honest. Be brutal. If you don’t know the answer, then get it, before you start any work on a new order. If you can’t rate every question, then don’t work the order. 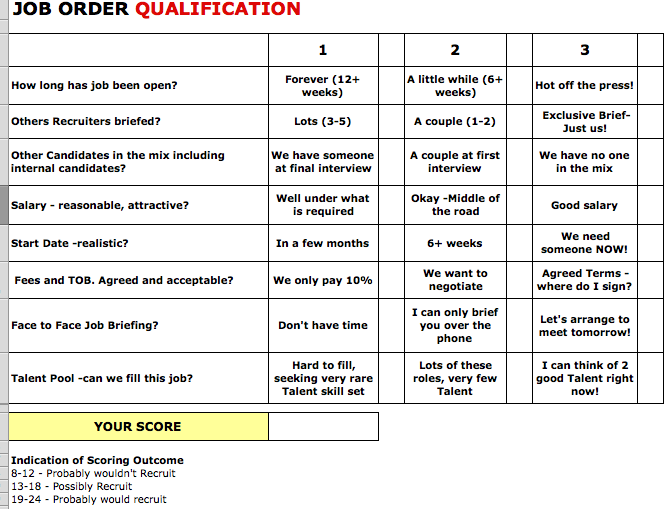 Then rank all your job orders by this scoring system. If you have plenty of jobs in the 19+ bracket… well... only work those! Don’t be distracted by unqualified, hard to fill orders with uncommitted clients. Better to work on 8 jobs and fill 6, than slave away on 20 messy orders and fill two! I am SO going to use this, thanks Greg! Sadly, this doesn't represent overall business opportunity at a client. If there were a line added in for that and weighted correctly, it becomes infinitely more useful. How would this checklist differ for contract assignments? Greg, I am very conscious of what jobs to work on and which jobs "aren't real" or are too much of a headache to accept. This list provides a very tangible way to determine which ones to keep and which ones to drop. I just sent this list to the entire firm! I believe it will be very valuable to everyone here. Thanks! This is an excellent summary of the process that experienced, successful recruiters do mostly subconsciously. It's helpful to see it spelled out, and new recruiters should read this as a first principle of recruiting and never forget it! Hi Greg, I have a question if a client has an in house recruitment team who are trying to fill the roles directly but they also use agencies than as a Recruitment Consultant even if they gave it to me exclusively the fact that I am up against the in house Recruiter should I still be working on it as its a 50/50% chance of filling it? Just printed the chart off and taped it onto my desk. Thanks for the excellent post Greg. We made a few copies of this, for all our team. Another fantastic article, Greg. I run a business providing community and thought leadership to in-house executive recruiting leaders. I believe in a mixed model as there are times the in-house team isn't the right service provider. I completely agree that both entities should not be working a search at the same time and so particularly applaud this item on your check list. If the in-house team has been working on a search and the decision gets made to outsource the project, the in-house recruiter should turn the search over to the new service provider and be willing to help in what ever way the new orchestrator needs. The same is true vice-versa. Collaboration between an in-house and an external recruiter can be very powerful, but one or the other must be the lead with the other in a background supportive role. Greg, what do you do if your employer resolutely insists that you work on jobs which you know to be complete and total garbage? I'm in a bit of a quandary because, other than this one small sticking point, I actually like where I work! Metrics? KPIs? Ratios? This is the ONLY one that matters in recruitment.